This post is part of my personal blog. It is not intended to be representative of any church or other organization I am associated with. I do not like to read books. It takes a lot out of me. I struggle to maintain focus and often to stay awake. With a few exceptions (mostly fiction like The Chronicles of Narnia, Harry Potter, and the Myst novels), I don’t usually enjoy it. I find it boring, time consuming, and even a little exhausting. But I love critical thinking. I’ve always liked math. I approach problems analytically. I enjoy more goal-oriented reading when I am seeking a piece of the puzzle hidden within the text. Fortunately for me, the Bible is great for the way I approach things. It’s broken down in bite sized verses, and there are tools galore for digging in to specific topics and texts. There is infinite value in digging deep, looking at exactly what words were used where, and why, and how that fits into the immediate and broader context. The personal studies I have benefitted from the most are those where I picked out a book and went through it chapter by chapter, stopping and seeking answers to any question that arose, anything I didn’t feel I completely understood, not pressing on until I was satisfied that I had either found the answer, or until I identified every possible understanding I could imagine of a statement or word or section or story, taking notes in the margin to remind myself of what I had found. I would try to identify themes and topics as I went along, and at the end I would try to summarize a book’s theme in one very concise statement. It wasn’t to prepare for a class or anything, just to learn and grow my own knowledge of the Bible. Huge thanks are due to my dad who bought me a Bible that is perfect for this the summer before I left for college! Reading through the Bible has always been a challenge for me. But as I think on how different this age is from the rest of history, I recognize most of humanity hasn’t had an electronic, searchable text, cross referenced to numerous commentaries, dictionaries, and lexicons at the click of a mouse or the literal touch of the finger from a device I carry in my pocket everywhere I go. Paul wrote to Timothy about the public reading of scripture, and he talks about his writings being read aloud elsewhere. We read about Joshua reading the entire Torah to the assembly of the Israelites, and Josiah having his advisors read Scripture aloud to him, presumably all in one sitting. The printing press wasn’t even invented until the fifteenth century after Christ, so considering how much effort it took to make a single copy, I presume scripture was mostly consumed by the early church in long readings when the church met. These texts were written and given in the context of a situation where not everyone would have a personal copy, at least for a time, so the expectation of the original writers of scripture must have been that books (or scrolls or whatever) would be each read in their entirety in a single session. The longest books only take between 4-5 hours to read through out loud, and most are around 2 hours or less, so this is not hard to imagine. Despite my aversion to reading any more than I have to, I want to experience the word through a wide angle lens, not just a microscope. And having done this twice, reading through the entire Bible in one month by reading entire books at a time in a single sitting, I attest to this approach being incredibly beneficial. It’s somewhat hard to articulate what specific benefit there is. I suppose it’s about what I expected it would be. I didn’t understand everything I read, but I got a good big picture view of what all is there. Some books were easier than others, and some were a better fit for this approach than others. I saw the failures of humanity contrasted against and answered by the perfection of Christ. I saw the fearful power of God, and the inexplicable love he has for man. I saw the gospel as central to every book, sometimes in places I didn’t expect to. I was able to reflect on entire periods of time and ponder the divine message conveyed in the progression and poetic nature often present in a book’s overall structure. It was less an process that developed my doctrinal understanding and theology, and more of an experience centered on assembling a framework and experiencing the nuance of how God thinks and feels about the earth, human history, and this race of created beings who consistently squander our potential and our purpose. To summarize, I felt, yes felt, in ways I don’t know how to describe, like I came to know God a lot better. Last year, I read in the traditional book order – Genesis to Malachi, then Matthew to Revelation. 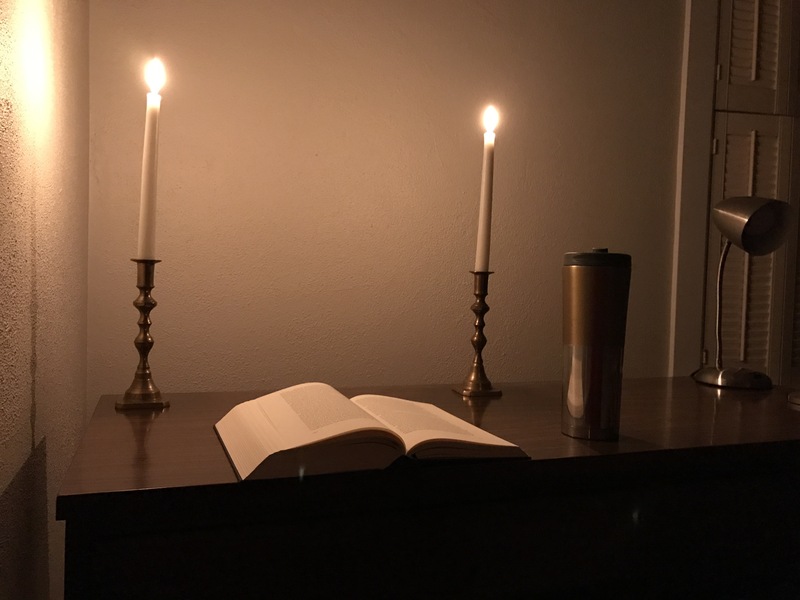 This year I read the Jewish Tanakh ordering of the OT and made up my own for the NT (see previous blog post for details). I very much prefer this ordering for the proposes of reading through. The way it breaks up the narrative is the main advantage here. Reading Chronicles right after finishing Kings is exhausting, for example. Things like like the inclusion of Ruth and Esther in the context of the mindset I had reading the Ketuvim were also refreshing. It’s nice to end the Old Testament reading Chronicles functioning as sort of a summary of the royal history, which begins by referencing the genealogy from Adam, rather than becoming exhausted with the repetition of the narrative from Kings. I believe that when Jesus says, “the blood of Abel to the blood of Zechariah,” he makes reference to the Tanakh ordering seeing that Abel is the first person murdered in Genesis (and ever) while Zechariah is murdered near the end of Chronicles, the last book of the Tanakh. I really liked reading Mark before Matthew before Luke, as each seems to build on the last with additional information, which external evidence suggests may be what actually happened. By far my favorite part of the whole month was ending on the Fourth Gospel instead of Revelation. The opening lines hearken back to the beginning of the journey through the Bible, revealing Christ as the crux of its entirety. The hope of the our resurrection is foreshadowed in Lazarus’ resurrection. The comfort and guidance of the Holy Spirit is central to Jesus’ final teachings. Jesus passion for his future followers in his final interaction with Peter is inspiring. 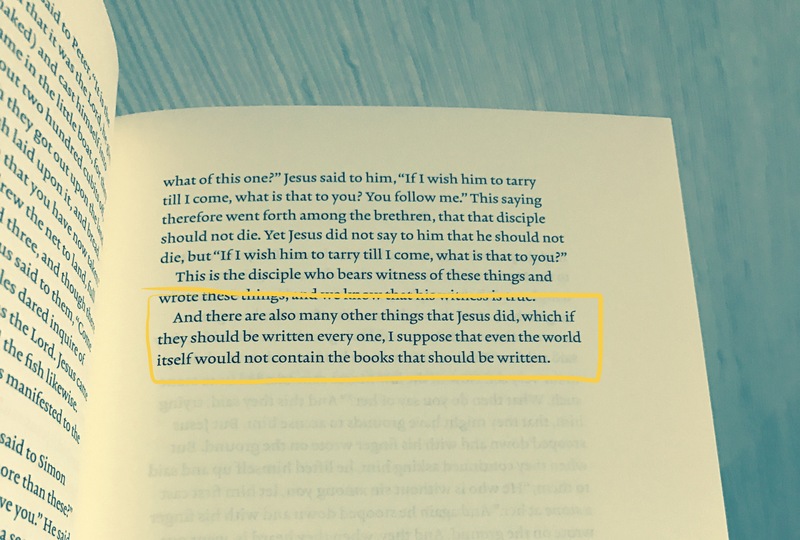 And the final statement of this gospel, written a generation after the other three gospels and likely written the latest of any inspired text, are the perfect bookend to the entirety of scripture. I think I benefitted more from last year’s reading of the English Standard Version than I did this year’s reading of the American Literary Version, which was created as part of the Bibliotheca kickstarter project. There is a lot I really liked about the ALV, including the use of YH and YHWH for God’s covenant name, and the replacement of words like ‘church’ with ‘assembly’ and ‘gospel’ with ‘good tidings’. There was an uneasy mix of modern and archaic language, however, and it didn’t always flow like I think a “Literary” version should. Overall I did appreciate and enjoy the ASV revision, though it could use some additional refinement. The main problem I had with the translation was the lack of an audio book to accompany my reading. I am not a good reader. Reading along with an audio book helped me focus on the text and maintain a consistent pace last year. Without the ability to do that, the process was much more of a chore, and took me longer overall since I struggled to maintain my attention as I read. It’s probably the last time I’ll do this without the ability to use audio assistance when I need it. Last year I read using mostly an iPad and an iBooks version of the ESV available for free (it is available on Kindle as well). It allowed me to remove verse numbering, cross references, and topic headings for a very clean and readable text organized in paragraphs without all the clutter, which is nearly essential to a through reading in my opinion. I could adjust the text size and colors to suit my preferences as well. Bibliotheca was even better – visually perfect, but not always comfortable in hand for long periods of time. The set is beautiful and well made. The page thickness, font, text layout, and quality of materials (with the exception of the bookmark) were perfect. I especially enjoyed reading the poetry sections with this minimalistic printing. I hope that we see more translations do what this and the ESV Reader’s Bible have done in presenting the text is a less encyclopedic way more conducive to reading. I did find the pokey corners and edges of the hard cover made each of the four books difficult to hold for long periods of time. The material used does not stay in hand held at an angle like leather would without supporting the weight of the book by the edges of the cover, and each of the books aren’t especially light. When you’re holding a book for as long as I was day after day, these things make a difference. A leather cover would have been nice. There is much more that could be said. I’ll conclude this by sharing what was most surprising to me about this process both years – the benefit of reading the entire book of Psalms in one sitting. 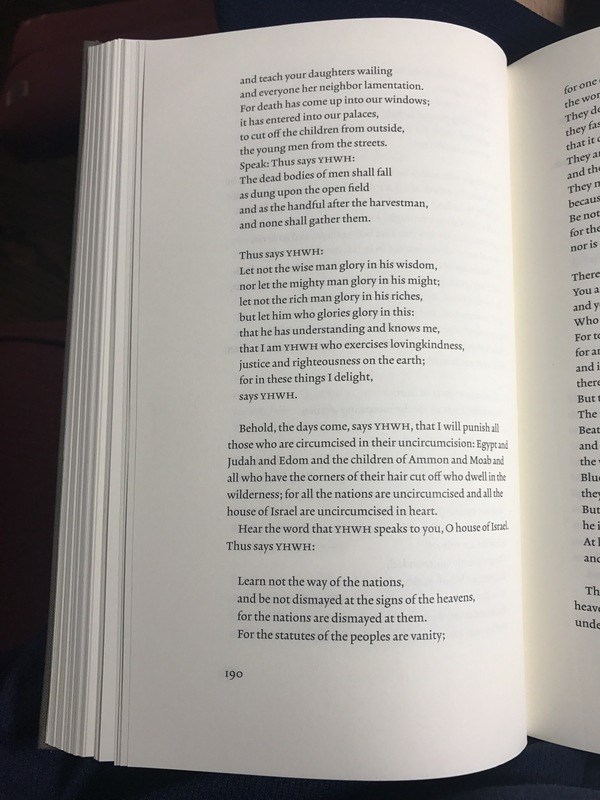 When I first decided to do this thing, I figured that the Psalms would be the worst candidate for a book suited to through reading. The Psalms are individual poems that have been compiled in a sometimes seemingly random order. While some people have done a great job speculating as to the purpose for the book’s organization, there is really no clear explaination for it. When I read through, both last year and this year, I felt like there was a different overall mood conveyed by each of the five books. While there may not be much significance to the order, repeated themes and beautiful progression of thought took my heart on a journey through the mind of Christ. 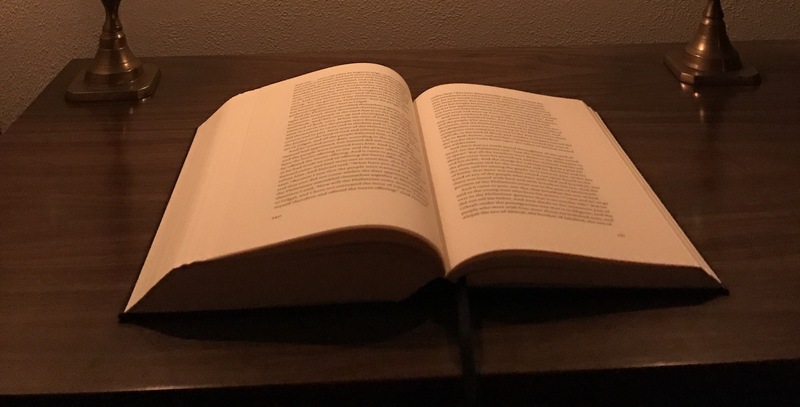 I was moved and inspired in a way that no other book of the Bible moved and inspired me in this process, experiencing joy, discomfort, confusion, sadness, pity, awe, hope, and self-reflection. The Psalms teach us how to praise and pray, how to rejoice and mourn, how to doubt, and how to hope. Make time to read scripture, friends. You won’t regret it. Excellent! Inspiring and encouraging Cliff. I have fallen in love with my audio Bible. It enables me to consume God’s word during times when reading a book is not possible (driving, working around the house, etc). Keep up the good work for the kingdom! We come from different theological orientations — very different, even — but I appreciate your dedication, insightfulness, and clear presentation of the experience. Interestingly, someone I work with mentioned to me this week they’re undertaking a beginning-to-end reading of the Bible this year. Now it’s gotten me contemplating the idea. I’m always up for a good theological discussion. We learn from our differences! I’d like to hear what your thoughts are if you decide to read through. Thanks for sharing your experience and insights, Cliff. Makes me want to go read the Bible in a month!